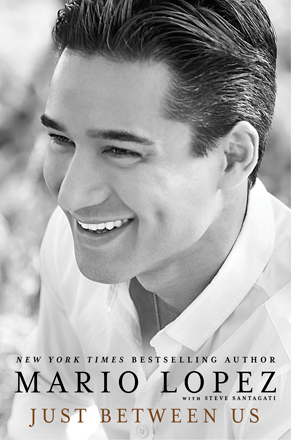 Book Description (Via Amazon): With a star that rose from unforgettable child acting roles, such as A. C. Slater in Saved by the Bell, to the forefront of today’s entertainment media, Mario Lopez is nothing short of a pop culture sensation. Now, as he turns forty, Mario looks back on his life with a newfound perspective and a humorous sensibility of how things have changed with age, divulging for the first time the endearing, surprising, and sometimes difficult experiences that shaped him into the loving father and husband he is today. With wit and candor, Mario reveals his most intimate never-before-told stories, including the details of his often tumultuous and largely public love life—giving readers a look at the ups and downs of his romantic past leading up to his happily-ever-after with his beautiful wife and their two children. This is Mario Lopez unfiltered, for the first time ever. I honestly enjoyed this book and found myself possessing new found inspiration when I was done. Mario Lopez colorfully divulges intimate details of his personal life and successes in the entertainment industry through the use of entertaining anecdotes and private experiences. Something that many people don’t know about me is that I admire Mario Lopez and aspire to walk in his shoes someday. He is a name well known throughout households not only for having been a beloved child actor in such shows as Kids Incorporated and most famously Saved by the Bell or because he was a fan favorite on the highly popular Dancing with the Stars. Mario Lopez, 41, is one of Hollywood’s most well known hosts for shows such as X Factor and MTV’s America’s Best Dance Crew but he has his own nationally syndicated radio show and is a television correspondent for the Entertainment News show Extra. Dreams which I steadily aspire to achieve someday. I loved how easy it was to relate to many of his accounts and the realistic quality of his story telling. Additionally, he disclosed that tragedy could affect any and everyone, no matter who you are; that following your instincts and making foolish choices affect us all. The book is written in a very conversational tone. I felt Lopez was very genuine in how he disclosed the details of his life. Having worked in the entertainment and music industry myself, could sympathize at the disappointment felt when a celebrity you admired and looked up to, turns out to be a complete A-hole that acts as if they are “too cool for school”. It’s an honest look into his life and his opinions, not only of himself and his family, but of a couple of well known A-Listers. I found it to be a great read and hope even more now, that I am able to connect someday with my personal example of a well rounded, family focused -individual and host. I did not he had a radio show. I thought he just used his young celebrity and looks to host tv shows. This was good info. There are tons of interesting facts about Mario Lopez that people don’t know. I admire him because he always worked hard and stuck to his gut. He was also able to break out of the A.C. Slater role to a point where people also know him by Mario Lopez.